"If it’s in the V, it’s in the tree. If it’s on the arc, it’s out of the park." That was the advice David Miller got from his father ahead of this match. And now the whole world will be chatting it like Gayathri mantra. Game 51, Hussey won the toss and decided to field first, As usual RCB stated with Gayle Assault to add up to it, this time Che Pujara also got a chance to get a fifty. As always for RCB, ABD finished the innings in a blistering fashion to end up with more than par score of 190/3 in 20 overs. KXIP didn’t have a start they were expecting losing Shaun Marsh early and followed both Mandeep & Gurkreet Singh. Skipper also left with out making any big impact in the stroke of 10th over with scorecard read 64/4, needing 127 in 60 balls. Till 13th over game was well and truly with RCB as KXIP was trailing by 95 with 42 balls to spare. Everyone thought it just formality for RCB to wipe it out, but David Miller strong young lad from South Africa, who has been fighting a lone battle for last few games, showed/proved his mettle by striking it hard and clear. Add to the woes, one the best fielder & skipper Kohli dropped a straight forward chance of David miller when he was 41. In the end Satish helped himself with a 20 but its again a One man show Killer Miller doing it for KXIP… From the stage of 95 needed of 42 balls, and winnings with 12 balls to spare says it all..
– Michael Nesar giving away 62 runs in his four over is the second most runs given by any bowler in IPL. – 62 runs given by Michael Nesar is also the highest ever by a debut bowler in IPL. – RCB with an opening stand of 102 today is the third for them this season, highest by any team for this season. – 58 runs scored by RCB in the powerplay equals their highest scored for this season against PWI. – Manpreet Gony has taken 10 wickets against RCB, most wickets taken by Gony against any other opposition. – David Miller average’s 322 while chasing for this season. – 101* in 38 balls is the third fastest hundered in IPL T20. List is topped with Gayle with 30 balls & Yusuf Pathan with 37 balls. – 130 runs partnership between Sathish & David Miller is the highest for the 5th wicket for this season. – The last five overs (13-18) of RCB went for 99 runs, highest ever scored in those overs in IPL career. – Bangalore have now played 5 away games and won just a game against Pune and lost the rest 4. – David Miller today: First 18 balls 27 runs (1×4,1×6) SR 150.00, Next 20 balls 74 runs (7×4,6×6) SR 370.00. – This is also the first century for David Miller in a T20 international. Game 1, Table topper CSK take on Mumbai, in Mumbai. Sachin & Smith started off slowly in a two paced wicket, Good bowling from CSK always kept Mumbai under control and picked wickets at regular intervals. 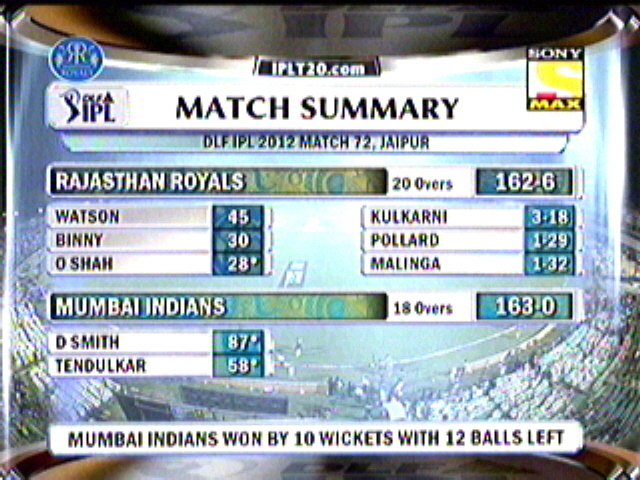 Late surge from Rohit sharma & Harbhajan gave Mumbai a decent total of 139/5 in 20 overs. It looked like a easy chase for CSK who were on a roll, but it wasn’t to be even after Pollard dropping thrice Michael Hussey in the three consecutive balls of the first over. Johnson came back in his second over and picked three important wickets to put CSK under pressure. However CSK failed to rise from the slump and dived deeper as they tried to rescue. At one point they were probable of even posting the lowest ever IPL score 58 runs, but somehow got out and ended on 79 all out with almost 28 balls to spare. Game 2, Royals host Pune this time very important game for royals as they the mid table crisis heats up after every game. Uthappa continued from the last game, played some sublime strokes through off side. Finch well supported him to get 97 runs opening partnership. Marsh & Matthews made sure the opening stand score is justified with a good finish as PWI ended 178/4 in 20 overs. Needing almost 9 runs an over Dravid opened with Rahane, in fact both a gave a treat to cricket lovers by playing classical cover drives, Straight drive, Lofted straight sixes. It was romance between Bat & Ball and everyone enjoyed to core. However as both departed quickly and the followed foreigners wasn’t able to do what they should but It was Sanju Samson & Stuart Binny who helped Royals cross the line with a ball to spare. – Chennai all out for 79 runs is the lowest score in this season of IPL. It is also the lowest score for Chennai in all seasons of IPL so far. – This is the first time Chennai have been dismissed for a score less than 100. – CSK have never won a game against Mumbai in Wankade Stadium, Mumbai. Stat stands 5-0. – CSK missed out the chance of becoming the only team to record 8 wins in a row. Now they are equalled with RCB with 7 wins in a row. – Malinga is now tied with Amit Mishra for most wickets taken in IPL with 91 a piece. 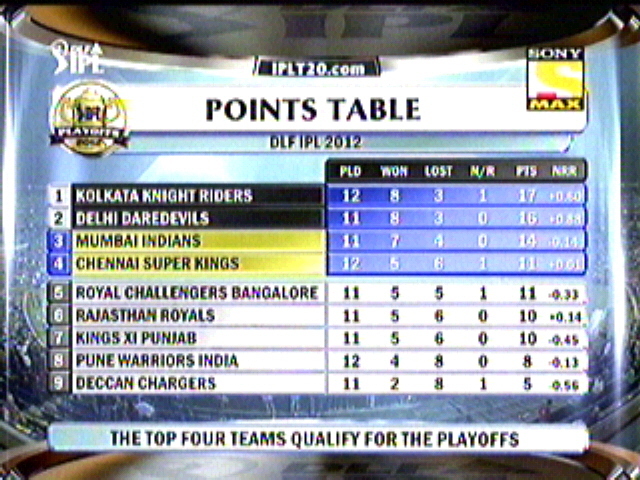 – This is also the first time CSK has been 4 down before powerplay overs were over. – Ojha has dismissed Dhoni 6 times in IPL. – 139 runs defended by Mumbai in Wankade is their New best, bettering 159 runs defended previously. – Ravindra Jadeja opened the bowling in a T20 game for the second time and went on to concede 4 runs in it. 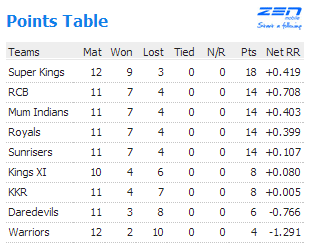 – Mumbai is the only team to have won more matches than CSK, they extended the lead today, with 8-5. – Uthappa has played 87 IPL matches and ironically lost 52 matches which makes him the most by any single player in IPL history to do so. – Uthappa scored hi 8th IPL fifty. – Rahul Dravid scored his 10th IPL fifty; it is also the 2nd fifty against PWI in this season. – Rahul Dravid went past 2000 runs in his IPL career. – Both Rahane & Dravid now has 9 fifty plus stands between them, third highest in the IPL history. – 97 runs partnership between Uthappa & Finch is the best for both, bettering the previous best of 96 runs. – Rajasthan Royals have won all their six games in Jaipur. – Mike Hussey became the second Batsmen for this season to go past 500 runs. Having a fabulous season Delhi will look themselves as favourites to reach their first finals, It would not be easy against the team which looked technically sound than any other team this season. Gambhir won the toss and decided to Bat first in a spin assisting track, Gambhir & McCullum provided the decent start within the 6 overs, as they were 48 runs losing the skipper to a poor running. Wicket was turning square even in the 7th over and KKR batsmen both Kallis & McCullum found it difficult to rotate the strike in the spinners over. But the best think for KKR is that, Pawan Negi is the only spinner Delhi had in the playing XI, which meant they can easily go after other bowlers. Wickets fell in quick successions then but Yusuf Pathan who had known very little this tournament provided his meat and scored vital 40 runs of 21 balls and well supported by Laxmi Shukla for his 24 runs. KKR scored 56 runs in last 4 overs which seems to have turned the game in the favour of KKR, with 3 spinners in disposal for Gambhir. KKR 162/4 in 20 overs. DD 144/8 in 20 overs. As expected DD started with a blast from Shewag & Warner. Just before Warner got a harsh decision for caught behind and the very next ball Shewag has to make a long walk back as this time batsmen has definitely edged the ball. Naman Ojha & Jayawardene continued playing some beautiful shots round the ground before Ojha going for a ambitious cut shot and failing to go over the fielder meant he has to go for 28 well made runs. Jayawardene was the only hope for DD as he tried his level best and finally stumped in his 40. Ross Taylor was held till 5th down, which seems to be a big blunder by DD, it was all over when Taylor walked in. In the end DD has to take their second chance to be in their first ever finals. Longest Six – Chris Gayle – 111,109,106,106 &106 Meters followed by Kieron Pollard – 105 Meters. Last day of League games, tiresome cricket over 6 weeks or so and it all boils down to last two matches of the season, One being very important for 2 teams mainly and other inconsequential game at the end of the day. A Must win game for Bangalore, They have to win this game to enter playoff’s and on the process they will knock CSK out of the league for the first time even without making off to the playoff’s. On the other side, Deccan’s have a chance to better themselves and place themselves at eighth spot rather than being the wooden spooners. Virat Kohli won the toss and decided to Field first, as he called RCB made early inroads by removing inform opener Dhawan for just 5, and followed Aksath Reddy & Cameron White with troubling much of the score, as DC were 20/3 in 4 overs. Sanga along with Duminy tried to restore the middle order with some slow paced innings as DC crossed 50 runs in 11 overs. Duminy played an important hand in the process and gave DC a modest total to defend. Chargers finished with 132/7 in 20 overs. The way RCB fans look at this score is, it’s just 4 more runs higher than Gayle would score (he scored 128* in 62 balls last match). As always Gayle started off in blistering fashion as he plundered 24 runs in the second over of the match, it almost looked match will be over by the first strategic time, if Gayle can continue his assault. But it wasn’t the case as Steyn this time ruffled Gayle and picked up with a well directed bouncer to inside edge into stumps, 6 balls later he picked up the fellow opener Dilshan to a very straight delivery who swung hard and missed right infront of the stumps. 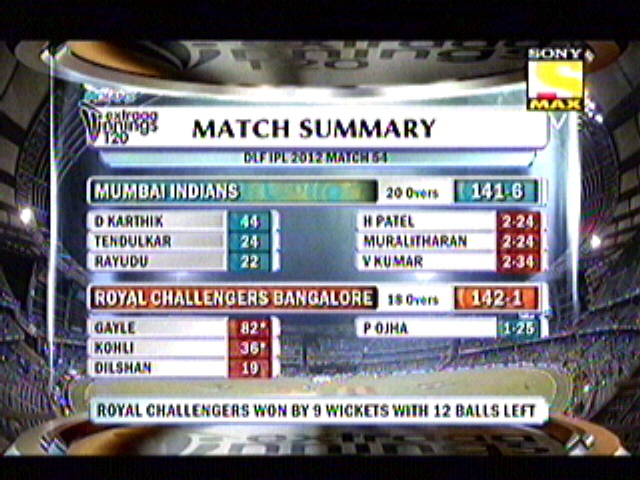 Mishra picked a couple more wickets esp the one of De villers to put pressure back on RCB. At this moment 57/4 in 10 overs. Kohli & Tiwary played from then sensibly found boundaries when ever needed, until Kohli had a mind freeze who slogged to Long off and get caught right after hitting a six. Tiwary tried his level best, but failed to with hold the pressure surmounting. As RCB failed to reach the target by 9 runs, which eventually turned out to be the killer knock for them. This win also means that Deccan will not finish at the bottom of the table as they will go past Pune and hold eighth position now. RCB out of the tournament which means CSK is into Playoff’s, having to see three matches to go their way and now they are into Playoff’s. Certainly Dhoni is a lucky fellow. Chennai will owe a lot to Deccan’s they have won two games out of no where. Thanks has to be presented to Amit Mishra & I can’t miss the person who breathe fire in bowling Dale Steyn. Only these gentlemen made this happen. Not much of a hype around this game, as its not going to make any difference for anyone. Though Mumbai want to win the game and keep the momentum going their way, Royals will like to finish one more to feature in the W column of the table. Dravid won the toss and decided to Bat first, Not a great start though as both openers walked when score was 31 in 5 overs. Binny & Watson played sensible cricket, but both had to depart when they tried to up the runrate. 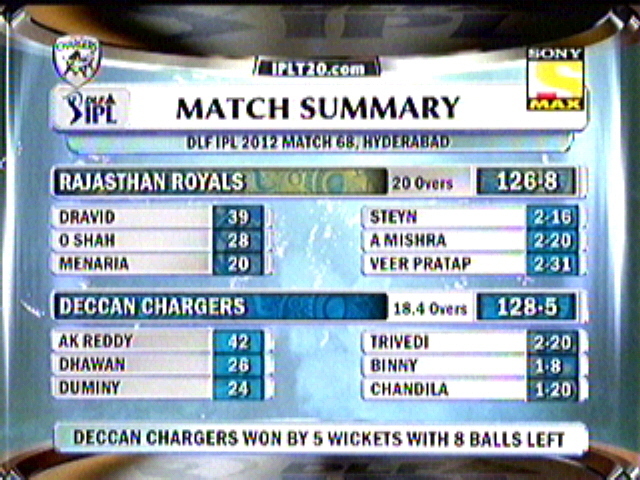 Shah & Menaria played few important shot and finally Rajasthan finished with 162 runs on the board. Mumbai know they have to win this one strongly to take the confidence into Playoff’s. As it said Sachin & Smith started doing it in style but with some luck added to it. None of the edges carried to the fielder always falling on the no man’s land. Even if one carried where Watson dropped it, That was the kind of day Royals had in field, their bowling looked very much clumsy, fielding was more shabbier than ever. Trivedi had picked up the wicket of Smith just after he crossed his fifty but to his agony it was a no ball. Nothing stopped them as they sped past the winning runs with 12 balls to spare. – Dwayne Smith scored his Maiden fifty in his IPL career. – Dhwan Kulkarni bowled the 27th Maiden of this season. – This is the first 10 wicket victory for this season of IPL. – 163 runs between Sachin Tendulkar & Dwayne Smith for the first wicket is the highest ever in IPL history, bettering 159 runs between Michael Hussey & Murali Vijay against RCB in last edition. – This is the first time out of 18 occasions Rajasthan have failed to defend a target of 160+. 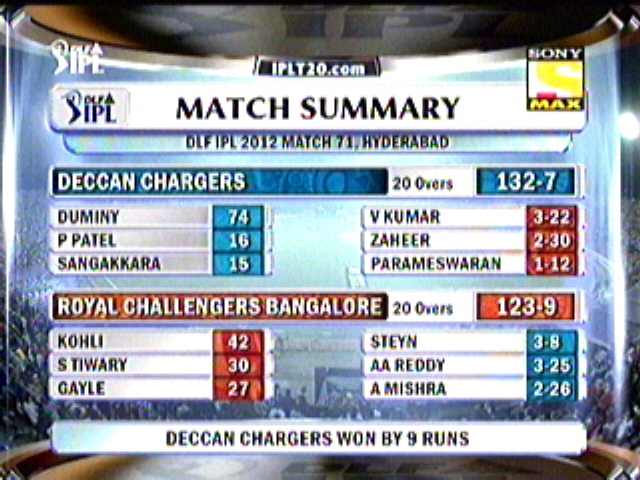 – Deccan Chargers won their third game in their home ground in Hyderabad. Out of three victories two have come against RCB and one was against Rajasthan Royals. – Sachin Tendulkar scored his second IPL fifty of this season, first was against CSK, where again both these men Dwayne Smith & Sachin stole the victory from the jaws of defeat. A day before the close of the league games of this season of IPL. Kings need to win this game atleast to be in the contention for the Play off’s, Delhi will look to secure the top spot, which give them a chance more for them to take the cup. Dharmasala it is, Delhi won the toss and decided to field first. KIXP was left to taste their own medicine, which they offered CSK couple of days back, this time Umesh Yadav, Varun Aaron & Morne Morkel provided it to KXIP as they were tottering at 20/4 in 5 overs. How ever Chitnis, & Azhar Mahamood played a sensible innings in the middle and late surge from Gurkreet ensure KXIP finished with a decent 141 runs on the board. For team like Delhi who are mostly Batting heavy, 140 was always gonna be easy, and if Warner was in the mood just like today, least could be spoke about other, as Warner himself won the game for Delhi, In the end V Rao did some finishing off’s to win the game and end the league stage on a high note. KKR need to win this to ensure their second position, on the other hand, Pune wants to finish with a win infront of the home crowd. Also this win will ensure that even if Deccan’s win tomorrow Pune don’t end up being the wooden spooners. KKR won the toss and decided to Bat first, All of a sudden PWI bowled really well and their fielding was too good, which meant KKR reached their 50 runs in 10.5 overs. Having McCullum in the crease for this long time. But Shakib switched himself to power mode which gave necessary impetus KKR looked for and Run rate came back very fast. Shakib finshed with 42 and McCullum finished with 41 runs. 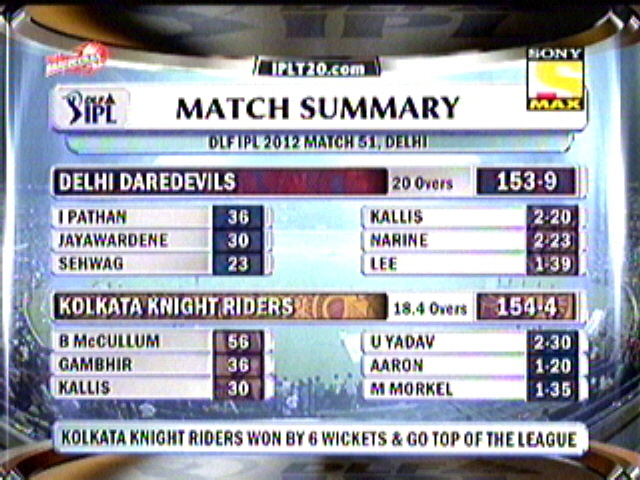 KKR finished with 136/4 in 20 overs. Needing to win to end their losing streak, PWI started with a boundary, but they hardly didn’t know that was going to be their only Boundary for the entire innings. Jesse Ryder got couple of Big hits over the fence and that’s all to say, as others walked past the crease and gone before u could read their names in full. PWI finished with a dismal 102/8 in 20 overs. 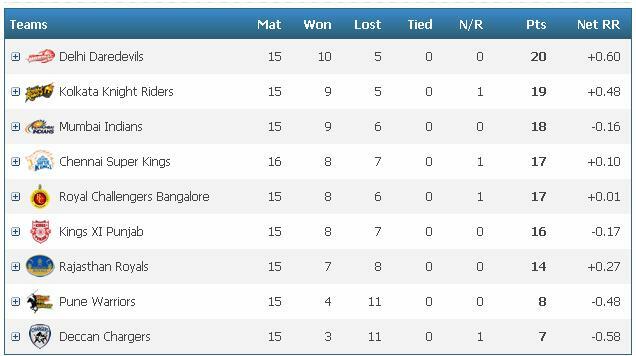 From the points table we can clearly say, we have just one more slot to fill it in, and two teams in contention is Royal Challengers Bangalore & Chennai Super Kings. Equation for RCB is quite simple, win the game enter Playoff’s, if you lose the game, better luck RCB we will meet next year, and CSK must the luckiest team ever in IPL history, having 3 other results have gone their way to bring them into Playoff’s. – Umesh Yadav bowled the 26th Maiden of IPL 5. – 4/20 is the best figures for Morne Morkel in this season of IPL, and now undisputedly he leads the wicket takers list. – Andre Russell became the 7th Bowler & 8th time to concede more 50 runs in the four overs bowled, other were Amit Singh, M Gony, A Nehra, M Patel, Vinay Kumar (twice) & M Morkel. – Second time for KXIP to get lost in the same venue (Dharmasala) which eventually taken them out of competition. – 1 Boundary & 2 sixes are the only boundaries scored by Pune Warriors India which means just 16 runs came of boundaries is the lowest ever in IPL history. Ironically, previous lowest runs scored in boundary is also by Pune Warriors 32 runs (5 fours & 2 sixes). – 94 balls without boundary is the highest ever in IPL history. Pune’s last boundary came in 4.2 overs when Jesse Ryder smoked one over long off, unfortunately they didn’t know that was their last one for the day. – Pune Warriors have now lost nine consecutive matches in this year’s IPL. This is now the new record for the most consecutive defeats in this tournament. Deccan’s previously lost 8 in a row. 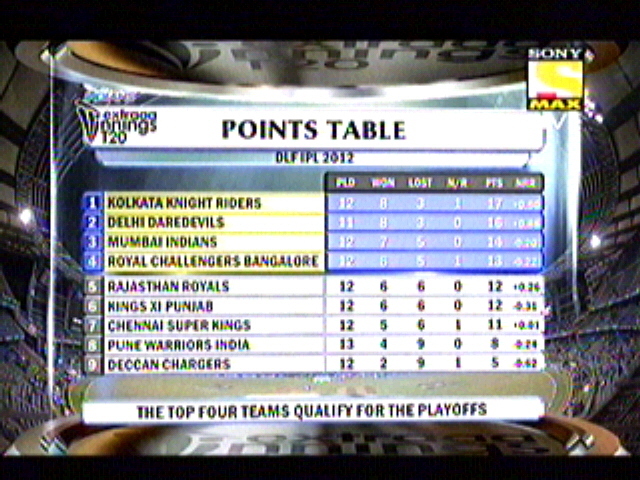 – With loss for KXIP, Mumbai Indians becomes the third team to qualify for the Playoff’s. – Delhi Daredevils have won 9 games while batting first in this season, out of their 11 wins. 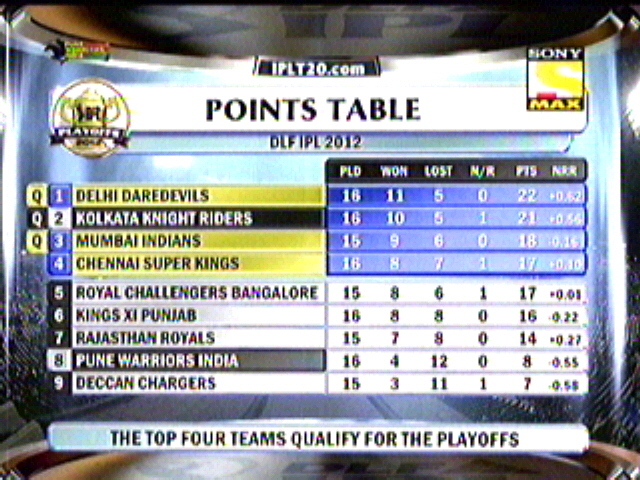 – Delhi Daredevils were the team which finished last in IPL 4, and now they finish as the League toppers. 1. Dwayne Bravo’s Miandad style finish against KKR. 2. Chris Gayle’s blistering knock of 128* from 62 balls against DD. 3. Rohit Sharma’s Classic century of 109* runs against RCB. 4. Fiery Ben Hilfenhaus bowling DD out of the match. 5. Inspired Hussey & Gurukreet take KXIP live another day. 6. Gilly’s come back in style to smile for all reasons. It’s one of the two games that Royals have to win to be in the playoff’s, For Deccan, it will be a spoiler if they can win it. Dravid won the toss and decided to bat first, Not the kind of start he expected as Rahane & Watson departed with meagre scores. Dravid with standed with few classic shots, but not before lofting Gony to the deep square hands with 39 runs to his name. Shah & Menaria tried to build the momentum, but they failed to do so, Eventually losing wickets at the wrong times. As RR finished with 126/8 in 20 overs. Deccan’s would have felt that they are in with a fair chance to win their 2nd game in front of their home crowd. Both Akshath Reddy & Dhawan gave a solid start scoring 63 runs in 8 overs, put the runrate way below the expected. But still DC wasn’t through with the game easily as Rajasthan pecked back with couple of wickets quickly, but this time Deccan’s didn’t press the panic button as they held their nerves quite well to pull off a 5 wicket victory and put Rajasthan out of contention. For KXIP to qualify – Have win their next game and wait for RCB to lose their game, that’s enough as they will knock CSK out as they will move to 18 points. For RCB to qualify – Just win the next game against – DC. – Win against Rajasthan Royals for Deccan Chargers is only their second victory in their home ground in Hyderabad in all the five season played. – Gayle is the first player in IPL to score more than 700 runs in an IPL season; previous best was by Sachin Tendulkar 618 runs in Season 3. – Gayle is also the Highest run scorer in the tournament with 128* runs. – Deccans’s 3rd victory of this season, and it is just against the second team, because they won both their previous matches against PWI. – Shikhar Dhawan went past Rahane to take the top scorer spot after Gayle, he is now with 564 runs and Rahane following with 548. Purple Cap – S.Narine (21) followed by L.Malinga (21) & Morne Morkel (21). Delhi’s David Warner’s swashbuckling century grounded Deccan Chargers even after scoring a decent total of 187 in 20 overs. Warner finished with 109* along with Naman Ojha who scored a unbeaten 64*. Earlier in the day Dhawan and White made their efforts to pick up the score to 187, they did little know it would be chased with 20 balls to spare. 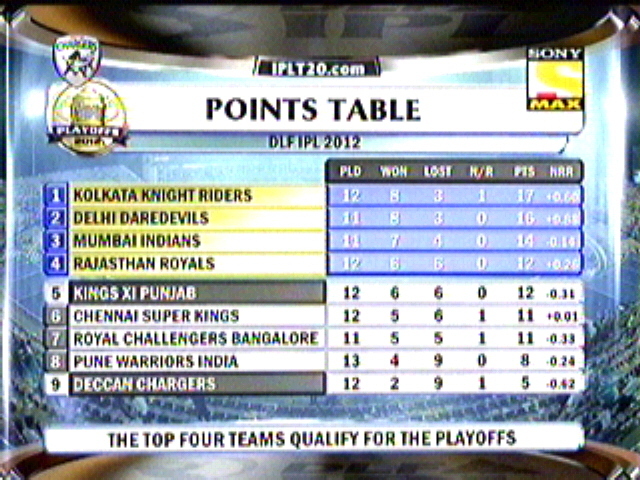 With this win Delhi move to the Top of the table, riding past KKR who is with 17 points with the same no .of matches. Rain intruded match started bit delayed, with enough breeze ball swung beautifully in both ways, Which Hilfenhaus used to his advantage picking up 4-1-8-2. Stringent bowling from CSK meant Royals weren’t able to pick the gaps easily and they finished with the lowest score of this season 126/6 in 20 overs. Chennai started off again on a wrong foot, this time Vijay going for a duck. Hussey & Raina continued to score in the difficult track with slow pace. Raina departed after a sudden brain freeze shot where CSK were 36/2 in 6 overs. Dhoni & Bravo couldn’t help much in scoring, Jaddu scored 16 runs with a boundary & a six. It looked almost game Royals when Jaddu departed with a score of 84, needing 43 runs in 20 balls. But new entrant Anirutha Sreekanth & Albie Morkel had a different plan, where they went berserk for next balls and match was over and Chennai won by 4 wicket with 11 balls to spare. Both Aniruth Srikkanth & Albie Morkel had the same figures in their batting, as we can see, both scored 18 runs in 6 balls with 2 sixes and 1 boundary. Finally Australianism in CSK prevailed atleast once for this season. – 109* scored by David Warner is the highest individual score of this season, bettering Rahane & Pieterson’s 103 runs. – 126/6 is the lowest total scored by Rajasthan royals for this season. – Andre Russell made his IPL debut for Delhi Daredevils. – 189* runs partnership between David Warner & Naman Ojha is the highest partnership of this season, and 2nd highest of all time just behind 206 runs of Gilly & Marsh against RCB. – David Warner scored the third ton of this season and second century in IPL. – 380 runs scored in 36.4 is the third time highest in match aggregates for this season, but the runrate of 10.36 occupies the top position bettering 10.32 by RCB Vs CSK. – Ben Hilfenhaus bowled the most economical spell of this season, bowling 4-1-8-2, at an economy of 2/over, he shares the record with Praveen Kumar who has 4-0-8-0. – David Warner’s century of 52 balls is the fastest of this season. – 28 runs scored in powerplay by Rajasthan is the lowest powerplay score for them for this season. – Both Aniruth Srikkanth & Albie Morkel had the same figures in their batting, as we can see, both scored 18 runs in 6 balls with 2 sixes and 1 boundary. – Victory by 11 balls for CSK is the highest no. of balls remaining for them in this season, on the other two occasions they reached the winning score in the last ball of the match one was with RCB & the other was Rajasthan Royals. – Ben Hilfenhaus bowled the 21st Maiden of this season. Longest Six – Chris Gayle – 111 & 106 Meters followed by Kieron Pollard – 105 Meters. Important game again in this context, A win for Mumbai will almost seal the place in top four, RCB needed to jump up in the table, which will add more pressure to the mid table crisis, but RCB will like to join the chores. Vettori dropped himself again, Stand in skipper Kohli won the toss and decided to field first. As expected by Kohli ball was doing much more than expected and Mumbai was exploited very nice by RCB bowlers in early as Mumbai were 5/2 in 4 overs time. Dinesh Karthik & Sachin had to mend a lot to bring back Mumbai into the context of the game, once Sachin departed when trying to accelerate. Rayudu & Karthik got things good enough for a late launch, but it wasn’t the case as both were dismissed in the space of 2 overs. How ever Skipper Harbhajan & Pollard grinned few hits over and to fence to help Mumbai to 141/6 in 20 overs. Just like Mumbai RCB was quite scratchy at the beginning and even Gayle offered a early chance to Dwanye Smith who dropped a swirler (only drop of the day too). Ojha stroke with a wicket as Dilshan adjusted LBW when score is at 48 in 9 overs time. Run Rate was creeping slowly, but however Gayle was too confident in getting the runs and he showed his intention in the third over bowled by Ojha as he sky rocked last three balls of the over to sixes and accumulating 22 runs in that over which almost turned game on his heads. From then on it was sail through kind of chase in a silent waters not even rubble’s to trouble. Gayle finished with 82* followed by Kohli with 36*. – 5/2 by Mumbai is the lowest scored by any team in 4 overs in IPL History. – Chris Gayle (515) took the Orange cap from Virender Shewag (468), not sure though he can continue to keep it to wear in the next game, as the both Delhi & Rajasthan have a game to play tomorrow. – Chris Gayle became the first batsman of this season to go past 500 runs. – Chris Gayle also won the 10th Man of the Match award. – Chris Gayle with 37 sixes to his name is the only batsmen to have more sixes than fours, as he has scored only 33 boundaries till now in season 5. – Gayle also scored the 6th IPL fifty for this season, highest of this season, followed by 5 each from Shewag & Gambhir. – Chris Gayle first innings of this season to end being Not out. – Chris Gayle also scored the 500th Six of this season. – A victory by 9 wickets is of the first for this season to get registered almost after 53 matches. RCB will be the proud owners to have won the match with highest no. of wickets remaining. – Rohit Sharma registered the second duck for this season; list was headed Manish Pandey & Harbhajan with 3 to their names. Purple Cap – L.Malinga (20) followed by Morne Morkel (20). Important game for Dravid to get a win against slightly easier team to beat at this stage rather to face Chennai & Mumbai and decide the place for Play off’s. Dada its time to restore some pride for himself and for his team as well, who knows this very well may be his last season of IPL. Ganguly won the toss and decided to bat first, Finally Dada back to his place, opened the innings along with Aussies counter part Clarke, didn’t click for long, Dada departed just before powerplay for 14 runs of 16 balls. To say i can’t write anything much about anyone as everyone was struggling to get the ball out of the pitch, Majumadar who play two exquisite shots which are the only two sixes for Pune innings. Credit to Rajasthan bowlers as well, they have been fantastic bowled to their field and plan. Tait,Botha & Binny were too good on the day. 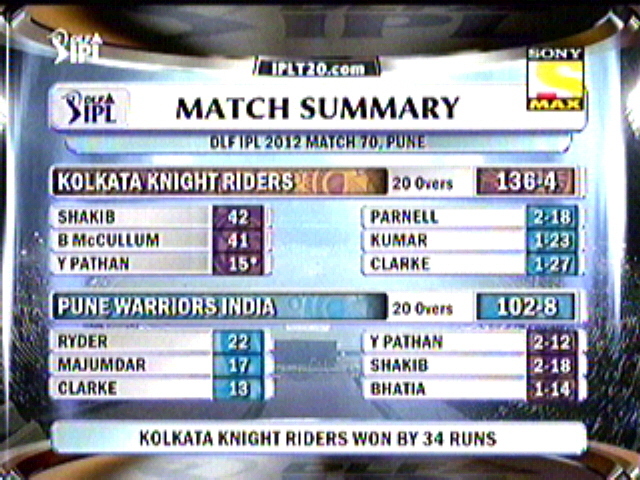 As Pune finished their innings with 125/6 in 20 overs which had only 5 fours and 2 sixes. Chasing a score close to 6 an over is a cake walk, but u never know, just when we thought that Smith pulled off a blinder to remove inform Rahane to remove for a duck. Dravid was also out too soon, but Watson decided to make it a one man show and he did as well. He pummelled 10 fours and 4 sixes to score 90 runs in just 51 balls and sealed the match for Rajasthan Royals in 16.2 overs. All to say Just man was there in second innings and it is Shane Watson from Australia. Same as Rajasthan important game for Kings XI Punjab who is also at 10 points need this win to be in the tournament with tough games coming up especially a couple against Delhi, too tough to say though. 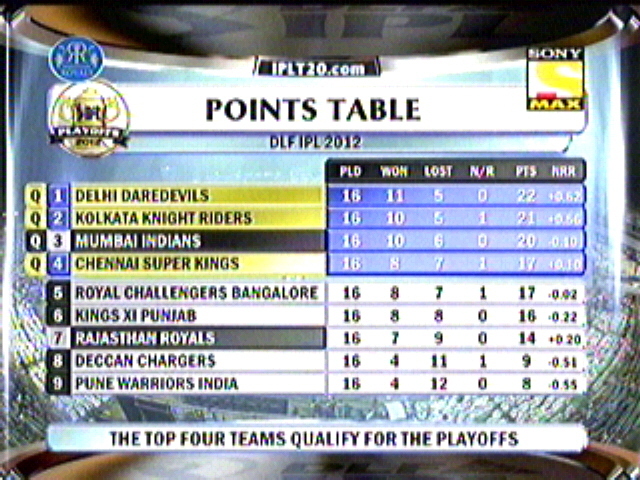 On the other side take away two points team at this stage for any opponent in IPL 5. Deccan’s won the toss and decided to field first, Thankfully KXIP obliged and got to a flying start with Marsh & Mandeep with 55 runs in 6 odd overs. Mandeep’s brilliance in batting was quite clearly displayed as he despatched the DC bowlers in ease, excellent textbook shot as well, with 8 fours and 3 hits over the fence Mandeep finally missed a straighter one trying to slog, while he was at 75 runs. Miller gave the late surge to boost KXIP total as it looked inflate enough to fly away for victory. 170/5 in 20 overs. Deccan Chargers didn’t show much hope in chasing the score, as they they 2 wickets for 31 runs, fromthen Dr.Harris & White tried to come back in the game with 40 odd runs partnership, but KXIP stand in skipper decided to bowl just one over in which he picked both the set batsmen to pavilion. Batsmen who came down the order just played out, to be fair to them pitch was quite uneven in the bounce as well. they can’t do much about it. 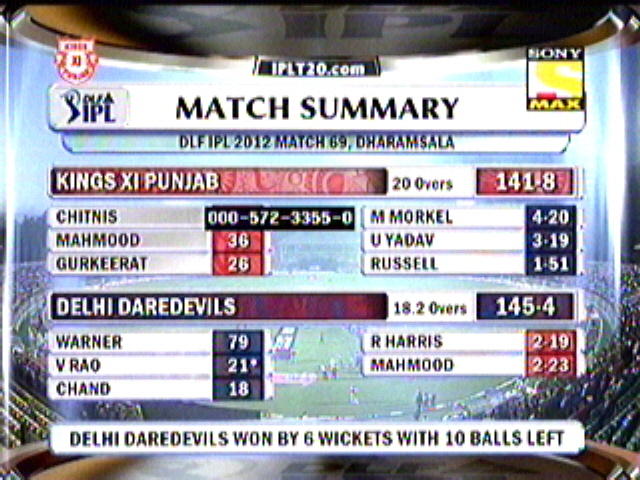 In the end DC finished with 145/8 in 20 overs. 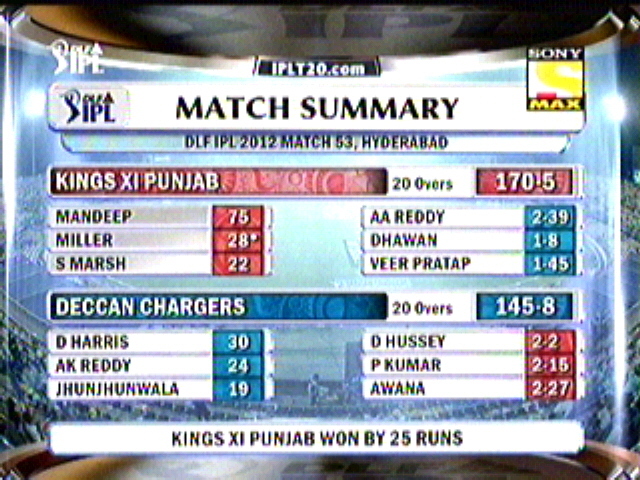 KXIP won the game by 25 runs. – 5 fours and 2 sixes a total of just 32 runs scored by Pune warriors in boundary is the lowest runs scored in boundaries. – 90* is the highest score for Shane Watson bettering 89 not out in season 1. 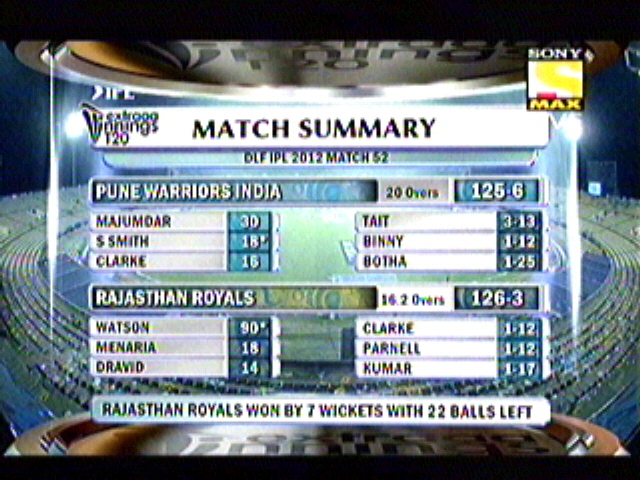 – Pune Warriors didn’t bowl even a single extra for a day. – Anustip Majumdar made his IPL debut for Pune Warriors India. – Rajasthan’s 22 balls victory is the highest ever by any other team other than Delhi daredevils who top the list with better than this. List goes as 40, 31, 28 & 24 balls. – 75 runs for Mandeep singh is the highest score in IPL career. Table toppers class, nothing more to write about form or how important this game is, as almost both teams have already made it to playoff’s. Shewag won the toss and decided to bat first, Skipper’s charm didn’t work out as much as expect as he fell for 23 runs, missing out on his 6th consecutive half century. Warner after early struggle, when about to break shackles, he fumbled as well as DD were 49/2. Jayawardene along with stumbling Taylor does the patch ups to bring back DD on track. Irfan pathan provided the necessary impetus in the end to bring Delhi to a respectable total of 153/9 in 20 overs. Sunil Narine being the mystery striker for KKR along with Kallis this time. KKR started off very well as both Gambhir & McCullum showed their class and picked up the boundaries and singles with ease. As 50 came in 5 overs. Gambhir dismissed at 36, then Kallis took charge along with McCullum who also picked up his first fifty of this season, Every thing was smooth as silk until both the batsmen failed to hook Umesh Yadav and was dismissed in the consecutive balls, but by then game was over and Yusuf Pathan & Das in the end ensured it happened with 8 balls to spare. – Brett Lee bowled the 20th Maiden of this which is again a first over maiden, played out by David Warner. – Sunil Narine bowled the 100th Dot ball of this season, highest ever by a spinner for this season. 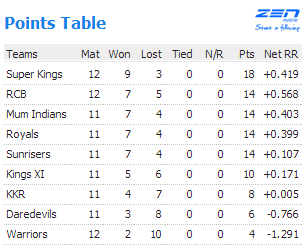 – KKR won their 6th game in succession. – Virender Shewag (468) went past Ajinkya Rahane (463) to pick up the orange cap. – Morne Morkel equalled the 20 wickets with the highest no. of wickets taken along with L.Malinga, but Malinga will still hold to the purple cap with better economic rate. – Gambhir went past 50 boundaries for this season; he is now with 51 to his name.